A few years ago in the muddy playground of the Byron Bay Bluesfest, I indulged in the music of many great favourites ... Ben Harper, John Butler Trio, Angelique Kidjo, Toni Childs, Michael Franti & Spearhead, Christine Anu and Xavier Rudd. And then I discovered ALABAMA 3 and found that extra something I'd been looking for. 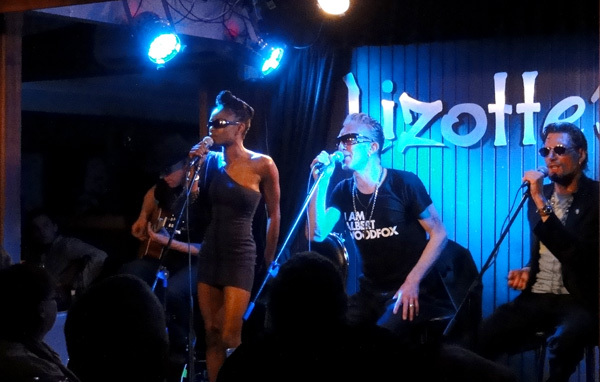 Alabama 3 is four piece band from Brixton in the UK. Their music has been described as soul, pop, punk rock, delta blues, gospel, country techno and electro. Just imagine a melodic Tom Waits with a funky, punk rock, soul, blues band and then add soul singer, Aurora Dawn, who just blows you away with her powerful voice. Last night, I went to LIZOTTE'S in Kincumber to hear them play. Lizotte's is famous for their award winning dining shows. I believe their chef serves some of the very best food on the coast. I had Salt and Pepper squid with herb & paw paw salad & passionfruit mayonnaise, followed by crispy skinned salmon with potato herb croquette & beetroot puree. And for sweets, I couldn't resist the 'Ju Ju's' chocolate, hazelnut & Frangelico self saucing pudding & raspberry sorbet, which was incredible. So after that there was no dancing for me, but I was happy to sit back with a cocktail and enjoy the music in this intimate space. The ALABAMA 3 CD's sold out at Bluesfest and they didn't have any to sell at Lizotte's, but you can buy them online from their website. You can see them live at Lizotte's Sydney on April 3rd, Bluesfest on 5th & 6th and the University of Sydney on 7th, before they go to Melbourne.